Back in March, I shared a remarkable study from the International Monetary Fund which explained that spending caps are the only truly effective way to achieve good fiscal policy. And earlier this month, I discussed another good IMF study that showed how deficit and debt rules in Europe have been a failure. In hopes of teaching American lawmakers about this international evidence, the Cato Institute put together a forum on Capitol Hill to highlight the specific reforms that have been successful. I moderated the panel and began by pointing out that there are many examples of nations that have enjoyed good results thanks to multi-year periods of spending restraint. I even pointed out that we actually had an unintentional – but very successful – spending freeze in Washington between 2009 and 2014. But the problem, I suggested, is that it is very difficult to convince politicians to sustain good policy on a long-run basis. The gains of good policy (such as what was achieved in the 1990s) can quickly be erased by a spending binge (such as what happened during the Bush years). Unless, of course, there’s some sort of constraint on the desire to spend money. And the panelists discussed the three most successful examples of reforms that constrain the growth of government. We started with a presentation by Daniel Freihofer from the Swiss Embassy. He talked about Switzerland’s “Debt Brake,” which actually is a spending cap. It’s remarkable how well Switzerland has performed while most other European nations have suffered downward spirals of more spending-more taxes-more debt. Here’s a chart I put together on what’s happened to spending in Switzerland ever since 85 percent of voters imposed the Debt Brake early last decade. By the way, Herr Freihofer said during the Q&A session that support for the Debt Brake is now probably about 95 percent, so Swiss voters obviously understand that the policy has been very successful. Our second speaker was Clement Leung, Hong Kong’s Commissioner to the United States. He talked about Article 107 and other rules from Hong Kong’s Basic Law (their constitution) that limit the temptation to over-tax and over-spend. And if you want to see some of the positive results of these rules in Hong Kong, here’s some of what Commissioner Leung presented. By the way, the burden of government spending in Hong Kong averages about 18 percent of economic output. That’s the most impressive result. And Commissioner Leung explained that there’s a commitment to keep the burden of spending below 20 percent of GDP. The final panelist was Jonathan Williams from the American Legislative Exchange Council, and he talked about Colorado’s Taxpayer Bill of Rights, popularly known as TABOR. Jonathan talked about how the pro-spending lobbies keep attacking TABOR, and he mentioned that they narrowly succeeded in getting a five-year suspension of the law back in 2005. But Colorado voters generally understand they have a good policy. The most recent attempt to enable more spending came in the form of an increase in the state’s flat tax back in 2013 and voters rejected it by a stunning 66-34 margin (almost as impressive as the recent vote against tax hikes in Michigan) even though Jonathan said advocates outspent opponents by a 289-1 margin. Here’s a slide from his presentation showing what happened during other attempts to enable more spending. By the way, Jonathan also mentioned that Colorado’s voters are about to get a TABOR-mandated tax cut because taxes on marijuana are pushing revenues above the limit. Talk about a win-win situation! To wrap up, one of the big lessons from all the presentations is that governments generally get in trouble because they can’t resist over-spending when the economy is doing well and generating lots of tax revenue. I fully agree, and I’ve previously explained this is why Alberta got in fiscal trouble, and also why California suffers a boom-bust budgetary cycle. The way you solve this problem is not with a balanced budget requirement (which often serves as the justification for tax hikes), but some sort of spending limitation rule. Regular readers know that I don’t approve of drug use, but that I also favor legalization because the Drug War has been a costly and ineffective failure. (And it’s led to horrible policies such as intrusive money-laundering laws and Orwellian asset-forfeiture laws). So I was happy when folks in Colorado voted to decriminalize marijuana use, even if part of me didn’t like the idea that politicians would gain a new source of tax revenue. If nothing else, what’s happening in Colorado (and Washington state) will be an interesting social experiment. And even though we only have a modest bit of data, I’m going to be bold and assert that we can already learn two lessons from what’s happened. 1. Politicians are so greedy that they set taxes too high. 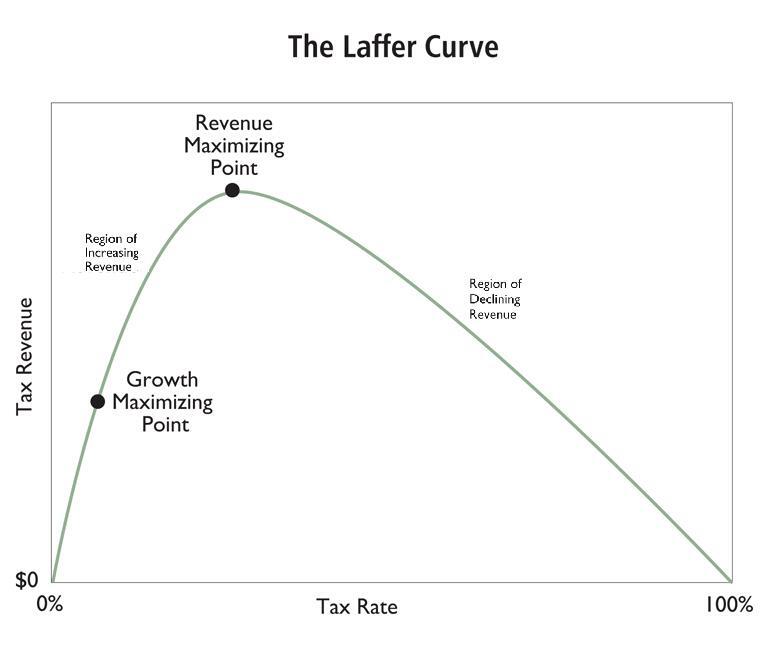 In the real world, there’s this thing called the Laffer Curve. And what it shows is that excessive tax rates don’t generate big piles of tax revenue because people change their behavior. I’ve made this point before when dealing with personal income tax rates, corporate tax rates, capital gains taxes, and tobacco taxes. Simply stated, the political class is so anxious to get more of our money that they impose punitive tax rates that fail to generate the desired amount of revenue. And it’s also true with taxes on marijuana. But don’t believe me. Let’s look at some news sources about what’s happened in Colorado. Here are some excerpts from a Daily Beast report. According to the Colorado Department of Revenue, the state collected $44 million in taxes from recreational marijuana in 2014, $25 million less than predicted. …why did recreational marijuana sales in Colorado fall short? …Coloradoans bought less recreational marijuana than they could have… Looking at the taxes on cannabis in the state, it’s not hard to see why. Pot taxes in Colorado are steep. In Denver, for example, an eighth of cannabis can come with four taxes: an excise tax, regular sales tax, special sales tax (for pot retailers), and a special city tax. That equals a markup of roughly 30 percent. …many pot aficionados looked at the numbers and decided to stick with their medical marijuana programs or their other dealers. Here’s some similar analysis from a New York Times article. Colorado’s tax results underscore a big conflict facing public officials considering marijuana legalization. Taxes should be kept low if the goal is to eliminate pot’s black market. …Colorado has also shown that pot-smokers don’t necessarily line up to leave the tax-free black market and pay hefty taxes. If medical pot is untaxed, or if pot can be grown at home and given away as in Colorado, the black market persists. And here are some passages from the Mic’s analysis. David Huff…from Aurora, told the AP that the state’s taxes on marijuana, which increase the price of pot by 30 percent or more, are too, um, high. “I don’t care if they write me a check, or refund it in my taxes, or just give me a free joint next time I come in. The taxes are too high, and they should give it back,” Huff said. …only 60 percent of Coloradans obtained their marijuana through a legal exchange in 2014. Some buyers are using the state’s legal medical marijuana, which is untaxed, as a source for green, while others take advantage of Amendment 64’s provision allowing the personal use of as many as six marijuana plants. The products of those plants have flooded the black market, depriving Colorado of more taxable pot. The bottom line is that politicians better figure out how to limit their greed if they truly want the legal market to function properly. 2. A spending cap ensures that new revenue won’t finance bigger government. I’m a big fan of restraining the growth of government. Needless to say, this means I don’t like giving politicians new sources of revenue. That’s my view on all of the proposals for new revenue that are percolating in the corridors of power, including energy taxes, financial taxes, value-added taxes, and wealth taxes. But if there’s actually some sort of binding limit on the growth of government, then politicians can’t use new revenue to finance a more bloated public sector. And thanks to the nation’s best expenditure limit, that’s the case in Colorado. Here’s what Mic wrote on the topic. Colorado’s state constitution limits how much tax money the state treasury can receive before having to return it to taxpayers. The provision, known as the Taxpayer Bill of Rights, or TABOR… Since Colorado’s economy has been growing as a faster rate than expected, the state underestimated its total revenue, which means Centennial State residents may soon get a cut of the estimated $50 million in taxes collected from the sale of recreational marijuana during its first year of legalization. 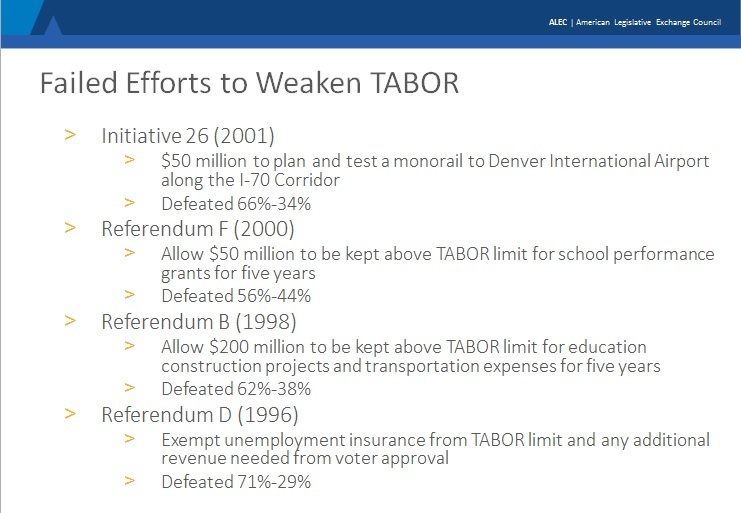 …TABOR, passed in 1992, dictates that Colorado can’t spend revenue made from taxation if those revenues grow faster than the rate of inflation and population growth. That money, known as a TABOR bonus, must be refunded to taxpayers unless voters approve a revenue change. This amendment has netted Colorado taxpayers about $3.3 billion since 1992. Let’s return to the Daily Beast story. In a state with one of the strictest tax and expenditure limitations in the country, Colorado operates under a Taxpayer Bill of Rights called TABOR. According to the bill, refunds are to be considered when state tax revenues don’t match up to the state estimates. This year, owing to a slight rise in the economy, the overall revenue was higher. Though you won’t be surprised to learn that politicians want to figure out a way of spending the money. Check out these passages from the aforementioned piece in the New York Times. Colorado will likely have to return to voters to ask to keep the pot tax money. That’s because of a 1992 amendment to the state constitution that restricts government spending. The amendment requires new voter-approved taxes, such as the pot taxes, to be refunded if overall state tax collections rise faster than permitted. Lawmakers from both parties are expected to vote this spring on a proposed ballot measure asking Coloradans to let the state keep pot taxes. So both Republicans and Democrats will join hands in an effort to spend the money. Gee, knock me over with a feather. What a surprise! But let’s not focus on whether politicians want more of our money. Let’s learn from TABOR. What it teaches us is that you get better policy when you limit the growth of government spending. And the closest thing we have to TABOR at the national level is the Swiss Debt Brake. It’s worked very well in Switzerland because it puts the focus on the underlying problem of too much government. Notwithstanding the name, it limits the annual growth of spending, not the growth of debt. The moral of the story is that when you address the real problem of too much spending, you automatically address the symptom of red ink. And politicians presumably won’t have much incentive to impose higher taxes if they can’t use the money to buy votes with bigger government, so it’s a win-win situation! P.S. Though there are some who favor higher taxes solely for reasons of spite and envy. Like all advocates of freedom, I normally despair about the future. Whether we’re measuring the ever-growing burden of government or the erosion of key forms of social capital such as self-reliance and the work ethic, it seems that the world is heading in the wrong direction. But, at least for today, I want to be optimistic. At least on the issue of guns. My good cheer may simply be a function of the holiday season. Or maybe my optimism is merely an illogical side-effect of having just enjoyed a couple of days of warm sunshine. But I don’t think so. I actually think we’re winning the battle to preserve the Second Amendment. And Colorado is Ground Zero in this battle. In an unprecedented move, two state senators – including the Senate President – were kicked out of office earlier this year because voters were upset that they voted to undermine the right to keep and bear arms. Then, more recently, another state senator in Colorado resigned her seat rather than face a similar recall election. Those political results were impressive, but it’s even more surprising that we’re now we’re seeing some very admirable forms of civil disobedience. But what’s amazing isn’t that citizens are refusing to obey tyrannical and unjust law. That’s inspiring, of course, but we’ve now reached the point where even law enforcement is refusing to comply. Here are some encouraging excerpts from a report in the New York Times about how Colorado sheriffs are openly stating that they have no intention of carrying out the misguided dictates of the political class. When Sheriff John Cooke of Weld County explains in speeches why he is not enforcing the state’s new gun laws, he holds up two 30-round magazines. One, he says, he had before July 1, when the law banning the possession, sale or transfer of the large-capacity magazines went into effect. The other, he “maybe” obtained afterward. He shuffles the magazines, which look identical, and then challenges the audience to tell the difference. “How is a deputy or an officer supposed to know which is which?” he asks. 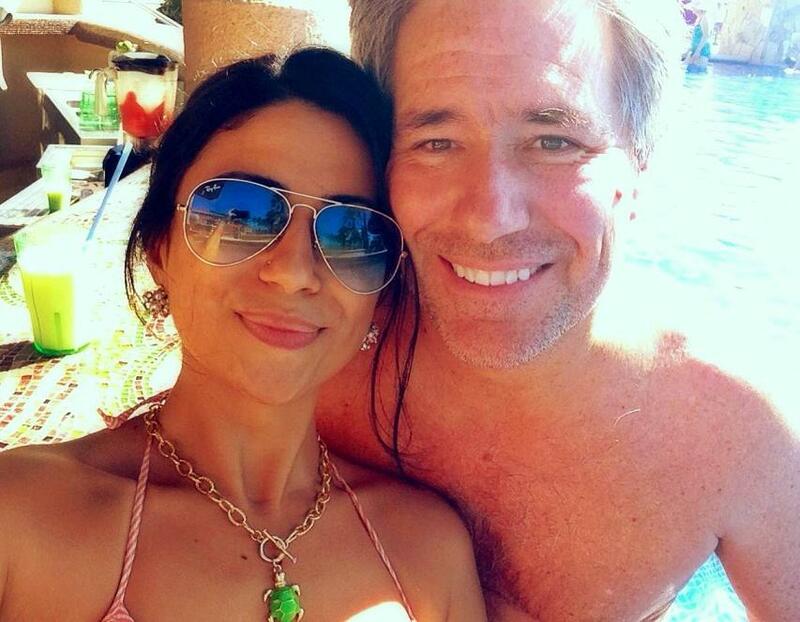 It’s not just Sheriff Cooke. …if Sheriff Cooke and a majority of the other county sheriffs in Colorado offer any indication, the new laws — which mandate background checks for private gun transfers and outlaw magazines over 15 rounds — may prove nearly irrelevant across much of the state’s rural regions. Some sheriffs, like Sheriff Cooke, are refusing to enforce the laws, saying that they are too vague and violate Second Amendment rights. Many more say that enforcement will be “a very low priority,” as several sheriffs put it. All but seven of the 62 elected sheriffs in Colorado signed on in May to a federal lawsuit challenging the constitutionality of the statutes. Even the Sheriffs on the wrong side of the lawsuit aren’t necessarily on the wrong side of the issue. Even Sheriff W. Pete Palmer of Chaffee County, one of the seven sheriffs who declined to join the federal lawsuit because he felt duty-bound to carry out the laws, said he was unlikely to aggressively enforce them. He said enforcement poses “huge practical difficulties,” and besides, he has neither the resources nor the pressure from his constituents to make active enforcement a high priority. Violations of the laws are misdemeanors. “All law enforcement agencies consider the community standards — what is it that our community wishes us to focus on — and I can tell you our community is not worried one whit about background checks or high-capacity magazines,” he said. We’re seeing healthy resistance in other states as well. The resistance of sheriffs in Colorado is playing out in other states. …In New York State, where Gov. Andrew M. Cuomo signed one of the toughest gun law packages in the nation last January, two sheriffs have said publicly they would not enforce the laws — inaction that Mr. Cuomo said would set “a dangerous and frightening precedent.” …In Liberty County, Fla., a jury in October acquitted a sheriff who had been suspended and charged with misconduct after he released a man arrested by a deputy on charges of carrying a concealed firearm. The sheriff, who was immediately reinstated by the governor, said he was protecting the man’s Second Amendment rights. …“Our way of life means nothing to these politicians, and our interests are not being promoted in the legislative halls of Sacramento or Washington, D.C.,” said Jon E. Lopey, the sheriff of Siskiyou County, Calif.
By the way, Governor Cuomo is half-right about “a dangerous and frightening precedent.” He’s just oblivious to the fact that this phrase applies to his policies, not to the Sheriffs who are obeying the Constitution and common sense. For more information on the Second Amendment and the folly of gun control, here are some great videos. P.S. Andrew Cuomo was Secretary of Housing and Urban Development during the Clinton years when the so-called affordable lending requirements were dramatically expanded, thus helping to pave the way for the housing and financial crisis. P.P.S. Another way of protecting the Second Amendment is for juries to engage in nullification and to refuse to convict people for peaceably owning and bearing arms. P.P.P.S. My fourth, sixth, and ninth most viewed posts are about gun control and the Second Amendment, so this obviously is an issue people care about.